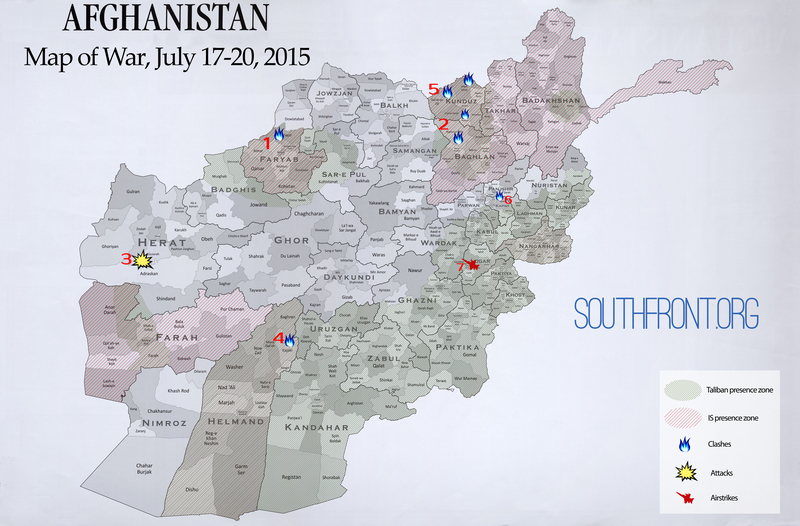 Afghanistan Map of War, July 17-20, 2015 0 out of 5 based on 0 ratings. 0 user reviews. The Taliban is taking the Faryab province, it has also started an offensive in the Baghlan-e-Jadid district of the Baghlan province, and has nearly seized the Helmand province. The actions are part of the Taliban’s Azm offensive, which began earlier this year. Most of the Taliban’s gains are a result of the Afghan central government’s unwieldiness, and inability provide assistance to local pro-government forces in the besieged provinces. July 17, The situation in the northern Afghan Faryab province that borders Turkmenistan is critical. Militants began attacking the province in early July, they have seized more than 100 villages in little over a week. Local pro-government forces called People’s Resistance Front are retreating in almost all areas of Faryab. The provincial capital, Maymana, is in danger of falling into the hands of the Taliban. The chief of the Faryab Provincial Council said “It’s a desperate situation” and blamed lack of support from the central government. July 17, The Taliban started an offensive in the Baghlan-e-Jadid district of the Baghlan province. Militants reported that they overran five military installations and cleared a huge area. There is no information about causalities, however, the Taliban suggested that a number of pro-government soldiers were killed or wounded. July 18, 6 policemen were killed and 3 were injured as result of a bombing in the Herat province. The incident occurred when policemen were patrolling the Guzarah district because of the Eid al-Fitr celebration. Eid al-Fitr is an important religious holiday celebrated by Muslims worldwide that marks the end of Ramadan. Local administration believes that the attack came from the Taliban. However, no anti-Government groups took responsibility for the violence. July 18, The Taliban claims it overran an Afghan military base and paraded troops through the bazaar in Kajaki, northern Helmand province. The terrorist group made the claim in a video produced by Al Emarah and released on Voice of Jihad, its official media outlet. The video “Azm Operations in Helmand Province, Graveyard of the British Empire,” shows a suicide bombing on an Afghan military checkpoint and a mortar attack on the base in the southern Afghan province. The video also highlights US-made Humvees used by the Taliban. They also claimed to have taken large portions of Kajaki. The video shows images of militants in the district, including Kajaki’s bazaar. The clashes in Helmand are part of the Taliban’s Azm offensive, which began earlier this year. Most of the fights have taken place in the northern Afghan province of Kunduz since end of the April. The districts of Imam Sahib, Aliabad, and Qala-i-Zal are under constant attack. Their current status is unclear, but it’s likely that the Taliban controls Imam Sahib and Aliabad. The Helmand provincial council reported the Kajaki district will be completely under Taliban control if the military does not launch a counter-attack. July 19, Afghan government forces launched an anti-terrorist operation in the Kapisa province. During the operation 2 militants were killed and 6 were detained. The operation took place in the Nijrab district. There is no information on which terrorist network the militants belonged too. July 20, The US Air Force bombed a checkpoint of the Afghan National Army in the Baraki Barak of the Logar province instead of Taliban positions. In the airstrike 8 servicemen were killed, 5 were injured. Afghan authorities report that the air raid wasn’t coordinated with the Afghan government. The provinces of Helman and Kandagar are very important due to TAPI (Turkmenistan-Afghanistan-Pakistan-India) gas project because the planned gas pipeline will connect to Pakistan through these provinces. Therefore the aim of militants is to take control of the territories that are supposed to be key points of gas transportation and profit from the control. Now the central government is preparing a counter-attack in Faryab, in the districts where the Taliban hasn’t taken full control. Meanwhile, it’s reported that the Pakistani Taliban is calling for the peace between the Afghan Taliban and the Afghan Islamic State militants. Notwithstanding a low chance of this, a potential unity of two the most destructive powers in the region could become a rival threat for the government of Afghanistan. It’s important to divide the Taliban’s presence, governance and attack zones. Presence zone: an area where Taliban is able to move freely (conduct offensives on isolated Afghan government-controlled points), exert physical pressure to assure that individuals/groups responds as directed. Governance zone: an area with direct Taliban governance (unclear even for Afghanistan authorities). Attack zone: an area where Taliabn is able to conduct terror attacks (at least the whole territory of Afghanistan). Example: On June 30, the Taliban claimed to the control of Dasht-i-Archi and Chardara district. Afghan government said it still controlled Chardara. To refute the government’s claims, the Taliban released a video showing its forces in Chardara district. So, the real governance in these districts is unclear. Thus, in this map we prefer to use the “presence” factor to determine an influence of different groups objectively. The same approach is used to describe Islamic State activity in the country.